Dr. (Smt) Geetha Ravikumar, B.Sc., M.A. Sangeet Acharya, employed with Reserve Bank of India, had her early training in Vocal Music (Karnatic) under her mother Smt. Mangalathammal and later in Vina under her sister Smt. Lakshmi Krishnaswamy, a reputed Vina player of long standing in A.I.R., Mumbai. She was a disciple of Shri Ramachandran for Vocal (Karnatic) and Sangeetha Kalanidhi Late Prof. K.S. Narayanaswamy (Vina), Principal, Sangeetha Viddyalaya of Sri Shanmukhananda Fine arts and Sangeetha Sabha, Mumbai. She had a initial training in Hindustani Music (Vocal) under Shri W.H. Ranade of Gwalior Gharana B.R.Deodhar's Indian School of Music, Mumbai. Later she completed M.A. (Vocal) in Hindustani Music under the able guidance of Dr. Prabha Atre and Smt. Meenakahi Mudbhidri of Kirana and Agra Gharana from S.N.D.T. University, Mumbai. She was groomed under the able guidance of three gurus of Agra Gharana viz.,Smt. Meenakshi Mudbhidri, Pt. Yashwant Bau Joshi and Padma Bhushan late Pt. C. R.Vyas. She has been awarded Doctorate in Music (Sangeetacharya) from Akhil Bharatiya Gandharva Mahavidyalay, Mumbai. A graded artist in All India Radio, Mumbai, she is an accomplished singer both in the Karnatic and Hindustani Style and is gifted with a declarative but intensely musical voice, which is also marked by depth and range. She is also a musicologist and an instrumentalist (Vina). She has given to-in- one concerts, (Hindustani/Karnatic) & lecture/demonstrations and conducted Workshops in India abroad. She has also participated in various Music Conferences and Seminars. She regularly contributed articles in the Bhavan's journal. Recently, she performed a Novel two-in-one Concert (Karnatic/Hindustani) in Chennai's Music Festival in December 2001. 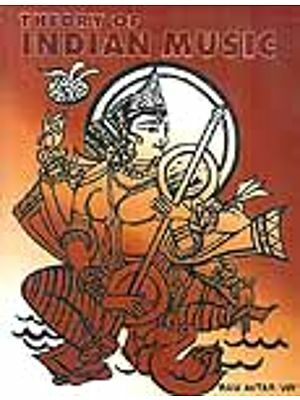 This book explains "The concept and Evolution of Raga in Hindustani and Karnatic Music" and is intended to give the Raga Profile, its image, or Svarupa in detail. This book consists of 4 chapters apart from the Introduction and Conclusion. The first chapter deals with the general history of Raga-s starting from Sama Veda, Marga, Desi, Grama, Murcchana, Jatis, Pann System of Ancient Tamil Music and also Kudumiyanmalai Inscription. The various concept and evolution of Raga aspects have been discussed with references from various Sanskrit texts like Natya Sastra, Naradi Siksa, Svaramelakalanidhi and Caturdandi Prakasika. The second chapter deals with the "Raga" the pivotal concept of Indian Music, beginning with Bharata's Natya Sastra on Jatis and its Dasa laksanas, Murcchanas and Raga definition given by different writers from the original source which have been explained in detail. The evolution of Raga from the Jatis seems to have taken shape after Bharata. The Grama Murcchana Jati system continued even after the birth of Raga. The third chapter deals with Mela Janya (Janka Janya) System and the classification of Janya Raga-s in detail. The fourth chapter contains two sections. Section I deals with Karnatic Raga-s and its Laksapnas in detail with an analysis each Raga namely Todi, Mayamalavagaula, Bhairavi, Mohanam, Kedaragaula, Kambhoji, Sankarabharanam, Arabhi, Suddha Saveri, Kalyani and Ritigaula. Section II deals with Hindustani Raga-s and its Laksanas in detail together with an analysis of each raga-s namely Kafi, Bhup, Alaihya Bilaval, Bhairav, desh, Darbari Kanada, Durga, Kedar, Todi and Yaman. This is followed by a general observation on the study of both the systems. The book deserves to be in every library and studied by every music teacher and student. Music has been defined as the art of expression in sound, in melody and harmony, both in composition and execution. Only to system of music are possible, one in which there progress by succession of single notes (called the melodic system) and the other in which the music progresses by groups of notes called chords. The latter is known as the harmonic system. It is the genius of India that contributed to the music world, the Raga system, which is, the highest peak to which a melodic system could reach. The outstanding feature of Indian music is this system, in which Raga is a distinct musical entries by itself and processes well-defined characteristics. The ideal of absolute music is realized in the concept of the Raga. The term Raga first occurs in the "Brhaddesi" of Matanga who describe it as "that which is beautiful or decorated by the tonal excellence of svaras and varnas and which gives pleasure to the mind of the listeners." This verse is quoted by later writers with slight variations. It is, however, strange that the word Raga is added to many panns of ancient Tamil music which are earlier to Matanga e.g. Takka Ragam and Megha Ragam. Such being the status of Raga in Indian music, it is no surprise that a voluminous literature has grown around it, particularly in Sanskrit. No Sanskrit work, however, mentions the bifurcation of Indian music into the Hindustani and Karnatic styles till we come to the 20th century. About the year 1914 Pandit Kashinath Appa Tulasi, a musicologist from Hyderabad, mentioned it in his Sanskrit work called "Sangita Sudhakara". In the sloka 'Tadapi dvividham' he said that "Indian music has two styles  Karnataka style in south India and Hindustani in the north". Even this writer called them only as two style of music. Appa Tulasi's work is often confused with another treatise with the same name written by a ruler Haripala of Saurashtra. With the passage of time, a vast amount of literature grew on the classification of Raga-s. In Karnatic music, four major works were written in Sanskrit in Thanjavur alone. These are the 'Sangita Sudha' of Govinda Dikshita (17th century), 'Chaturdandi Prakasika' of his son Venkatamakhi (circa 1650 A.D.), the 'Sangita Saramrta' of Tulajaji (1735 A.D.) and the 'Sangraha Cudamani' of Govinda (18th century), Raga's were divided into numerous categories like Janaka and Janya raga-s, Ghana, Naya and Dasya, Upanga and Bhasanga and so on. Hindustani music is more performance-oriented and unlike Karnatic music, theory is being given only secondary importance. Yet, musicologist Vishnu Narayan Bhatkhande of Mumbai, studied the south Indian Mela system and classified all the popular Ragas under ten Thats. A comparative study of the 'Concept and Evolution of Raga in Hindustani and Karnatic music' was long overdue but only a musician well-versed in both the styles could undertake the task. Smt. Geetha Ravikumar is a fully competent musician for the onerous job and I am happy that she has now come forward to publish her Ph.D thesis which secured for her the 'Sangeethacharya' Degree from the Akhil Bharatiya Gandharva Mahavidyalaya, Mumbai. Geetha is a vocalist trained in both the style and a theoretician. 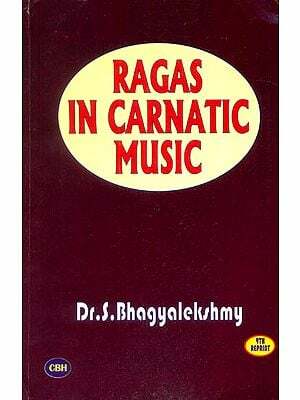 With Dr. Vasantrao Rajopadhye as her guide for Hindustani music and myself for Karnatic music, she made an intensive study of the concept and evolution of Raga in both the style and produced this excellent and self-contained thesis which she has edited suitably and brought out in book form. This study is based on a scrutiny of the relevant literature in the libraries of the Madras Music Academy, Saraswati Mahal (Thanjavur) and S.N.D.C. University Library in Mumbai, discussions with eminent scholar and careful listening to recorded music. She consulted an eminent Sanskrit scholar for the translation of verses and spared no effort to ensure that the material presented was precise. I congratulate Geetha on her prodigious effort. The book deserves to be in every library and studied by every music teacher and student. I grew up in an atmosphere of music and received in encouragement in the art from my parents. I learnt classical music (Karnatic), initially from my mother, and later from my sister, Mrs Lakshmi Krishnaswami, eminent Vainika and Graded Artiste in the A.I.R. and also in Vina under Sangeetha Kalanidhi K. S. Narayanaswamy. I came to realize the great divinity and importance of musical compositions. Learning various compositions in different raga-s became an obsession with me. Later on, I underwent training in Hindustani Music (Vocal) from Deodhar school of Music and passed B.A. (Vocal) Sangeetha Visharad in first class from Akhil Bharatiya Gandharva Mahaviddyalaya, Miraj. Further, I completed my Master's Degree in Vocal Music (Hindustani) under the able guidance of Smt. Meenakshi Mudbidri and Dr. Prabha Atre and successfully passed M.A. in First Class. Further, I decided to take up the topic "The Concept of the Raga" for an indepth study. Dr. S. A. K. Durga. Ethnomusciologist, my professor for M. A. in World Music and Western Music, suggested the topic "The Concept and Evolution of Raga in Hindustani and Karnatic Music" for my Doctoral Research. I am deeply indebted to Dr. Vasantrao Rajopadhyee (Hindustani) and T. S. Parthasarathy (Karnatic) for having provided me with invaluable guidance and support at every stage of my work right up to its completion. Since I had collected valuable material from several sources to prepare the thesis, my friend and music-lovers advised me to get the thesis printed in the form of a book to make it available to the world of music lovers. I express my sincere gratitude to the Bharatiya Vidya Bhavan, Mumbai for having agreed to publish my thesis in book-form and also for having secured me with the necessary financial assistance. This kind gesture on the part of the Bhavan has added considerable prestige to the publication, for which I shall remain ever grateful. "The Concept and evolution of Raga in Hindustani and Karnatic Music" is intended to give the Raga profile, its image or svarupa in detail. It is the result of my regular training, knowledge and continued interest in both the systems. The concept of the Raga and its elaboration, 'raga alapana', are something unique to be found only in Indian music. There is no raga alapana in Western Music or in any other system. An overwhelming majority of the creations in Western Music employ only one Raga called the Major Scale which corresponds to our Sankarabharanam. A Minor Scale. Different Schools of Western music use a slightly different combination of notes for the Minor Scale. Kiravani in our system corresponds to the Western Minor Scale. There are schools which call our Natabhairavi as the Minor Scale. Coming to the Eastern World, the scale of our Mohanam is widely prevalent in China, Japan and other countries. In major parts of the Globe, the music world is thus sustained by one or two scales. India can justify be proud of using not one or two but some hundred scales, may Ragas. The scale is only a skeleton and it requires a life, body and musical status when it is put to use as a Raga. The notes which are pinpoints in a scale are traveled through in high sophistication in Indian music with the aid of inimitable graces called gamakas. This artistic transformation of a scale into a Raga is a unique phenomenon existing only in Indian music. A Western symphony is made of artistic combination of notes. It becomes enjoyable because of the composer's ability to make the best use of consonant and assonant pairs of notes, traveling from one note to another only in straight lines. In Indian music the travel from note to note is rarely in straight lines and endless varieties of curvaceous travel is encouraged. This is exactly how and why the Western scholars find the possibilities in Indian music in-exhaustible. Adorned and vitalized by gamakas the scales become Raga-s with a distinctive personality and identity. This phenomenon is sometimes carried to extremes by ascribing a svarupa or personality to each Raga. Some scholars have referred to by phenomenon as the Raga-Ragini-putra scheme. This study assumes that there are male and female Raga-s which their own offspring. Even more assertive is the fact that some painters in Rajasthan have actually painted and portrayed some of the traditional Raga-s as if they are human beings. Such is the high level of awareness in India for sound edifices and it is easy to imagine how far below in this aspect are the other systems of music which do all their articulation with just a scale or two. No wonder Indian music is rightly called Raga music. In every combination of notes, the ascent and descent is nourished, embellished and nurtured to flower into a Raga and an all-Indian music is conceived only through these Raga-s. It should be noted here that random combination of notes will not have the requisite potential to be raised to the status of a Raga and those combinations which have blossomed into a Raga have been accepted as entities in the mainstream of Indian music with their own history, growth and chequered career. Details of the origin, growth and history of these Raga-s are given in this book. All countries of this world have their own folk music. In India there is a distinct folk music style in many regions such has Andhra and Bengal. But all countries cannot boast of a classical music of their own. In Europe, for instance, there is only one system of classical music called Western Music which has found its way into the countries of the Eastern World. India has not one but two great systems of classical music, Karnatic and Hindustani. Fundamentally, the two systems are the same and the difference lies only in the manner of handling rather than the matter handled. Sr.No. of Chapter Page No.